Kabbage and Fundbox are two major market leaders when it comes to business loans for small to medium sized businesses. We go through features such as their pros, cons, loan terms and fees to help you make your decision. While they aren’t similar in many ways, one thing Kabbage and Fundbox have in common is their unique approach to lending. Most of the top business loans providers look towards credit scores and history as their barometer for whether or not to lend an amount, how much to lend, and what kind of APRs to charge. 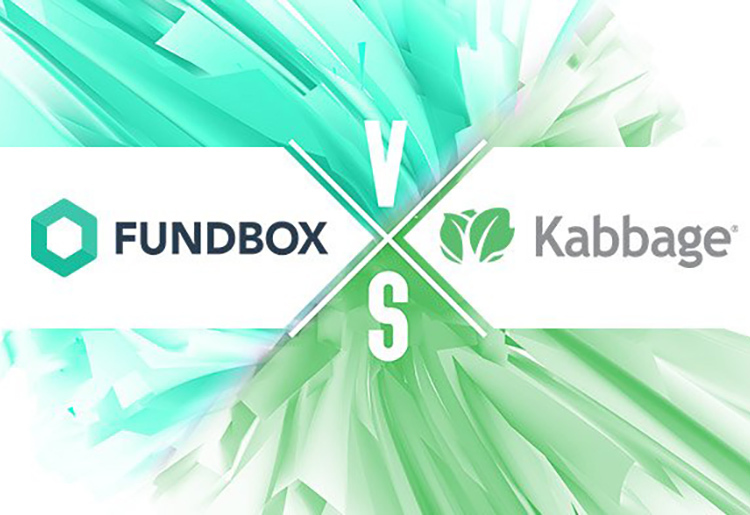 Kabbage and Fundbox both take a different approach. Instead, they focus on your current bank account status and other relevant details about your business to make these all-important decisions. This makes them ideal for new businesses or those with really low credit scores that would disqualify them from borrowing the needed funds from more traditional lenders. Similarities aside, though, which lender is the better of the two? Check out how Fundbox and Kabbage square off in this business loans battle, so you can decide where to apply for your next loan. Kabbage’s application process is super smooth and easy, and it can be completed online within a matter of minutes. Another nice thing about Kabbage’s application process is that it doesn’t require any of the usual documentation that many other online lenders ask for. Instead, you’ll just have to put in some information about your business such as business name, tax ID, and the date it was founded. From there, you’ll be prompted to sign up for an account, but this is also a lot less intrusive than most lenders. A common complaint that you’ll hear about lender portals is that potential borrowers are flooded with annoying marketing calls from the moment they sign up. Kabbage does away with all that nonsense, so signing up poses no such threat. Next, you’ll need to connect Kabbage to either a business bank account, your current bookkeeping software, or some sort of payment platform. This is how Kabbage will verify that you are eligible for services. Once the application is sent in, you can get an answer, sometimes immediately. The faster Kabbage can verify your business information, the faster you get your funds. In fact, if you opt for direct deposit using your debit card or a transfer to your PayPal account, you can even have the money on the spot. Fundbox has the same ease of use and online accessibility in terms of application process. You won’t have to fill out a lot of personal details either. You just need to grant access to your business account so that Fundbox can verify your business activity over the last 6 months. Approval can happen in a few hours and funds can be transferred the next day. Kabbage squeaks by just ahead of Fundbox in this category only because you can actually get approved on the spot and have the money transferred to your funds on the same day. Those are super-fast terms that you just can’t beat. Be sure to look at the loan terms before you do anything else when weighing business loan options for yourself. Fundbox is a fresh and hip lender, and its loan terms speak that same contemporary language. Businesses can ask for loan amounts from $1,000-$100,00 with repayment options ranging between 12-24 weeks of weekly repayment schedules. APRs range from 15%-60%, but on average they tend to the higher side of that scale, along with a weekly fee of 4.66%-8.99%. If you want to borrow and pay back your loan as quickly as possible, then this could be a good option for you. With its monthly repayment schedules, Kabbage has a more conventional loan term structure that is reminiscent of the traditional lenders you’ll find in the industry. If you prefer going with the standard, Kabbage is definitely a more suitable option for you. Kabbage offers loans from $2,000-$250,000 that can be paid out over either 6 or 12 months. While the average borrower is looking at paying anywhere between 30%-50% APRs, Kabbage starts offers as low as 15%. The monthly fees borrowers can expect to pay are between 1%-10% of the overall loan amount with an interesting repayment structure for those fees. The 6-month plan will charge you the higher rate of 10% for the first 2 months, decreasing that fee to 1% for the remaining four months of repayment. Alternatively, you can opt for a 12-month repayment plan that will charge you 10% for the first 6 months, and then 1% for the remaining 6 months. Having longer to pay out your loan means you pay less each month, an attractive incentive for most small businesses. That, and the fact that the loan amounts available are higher, makes Kabbage a better choice for this category. Eligibility is an important category to weigh when choosing a business loan provider. After all, if you can’t get approved, then it’s certainly not the right brand for you. What’s nice about both options is that they have no minimum credit score. Meaning, they will work with anyone, regardless of credit score. You generally receive a much higher APR, but you’ll get your money one way or another. Kabbage requires a borrower to be in business for between 1-3 years depending on how much you want to take out. It also expects a higher annual revenue of anything between $50,000-$500,000 depending on the size of the loan you wish to take. Lastly, a company must have either a business checking or PayPal account for them to work with. Fundbox has really loose eligibility requirements. It has no minimum credit score and only requires you to be in business for 6 months if you are looking to take out a loan (even more impressive, Fundbox only requires 3 months in business for invoice financing). Fundbox also requires a small minimum of $25,000 worth of annual income (none for invoice financing). These terms are a lot steeper, and somewhat out of character with the laid back persona this company seems to be projecting from its other, more lenient terms. When all's said and done, however, even these more complicated eligibility requirements are lighter than Kabbage’s and certainly better than other lenders you’ll find out there. Both of these lenders offer relatively low payment percentage fees and none of the usual fees that other lenders do charge (prepayment fees, for example, that penalize you for paying off your loan early). Fundbox has a slightly lower payment percentage fee because Kabbage takes the lion's share of that charge out at the beginning of the contract (10% as mentioned above). So, even if you do end up able to pay back the loan early, you are only saving a little bit if you pay it back after the first 6 months. Kabbage has an excellent mobile app that lets you track all your current loan balances, manage account transactions, and make loan payments all from your mobile device. What's more, Kabbage allows you to apply for a loan quickly via the mobile app, a feature unique to this company. Kabbage is also known for having excellent customer support. This is a rare commodity in the lending industry and not something to be taken lightly. Fundbox does have an excellent reputation among the industry, however. One of the things that makes this company so popular is that it doesn't require a personal guarantor on the loans taken out. This means that if your business fails, you will not be responsible for paying off the loan from your own personal funds. Fundbox also has an amazing invoice factoring service. This service is a godsend for businesses that have outstanding invoices but need the working capital upfront. Fundbox will take care of these for you, giving you the money to work with and only expecting repayment according to your repayment schedule. Overall, while we like both options for funding your business loans, Kabbage is the winner of this particular battle. They offer customers a larger line of credit, longer loan terms which makes it easier to pay them off, and comprehensive monthly repayment scheduling. Kabbage is an excellent choice for businesses looking to cover their day to day expenses with a solid stream of working capital. Still, Fundbox is a good option for small businesses that just need a small cash advance to get things rolling. Find out more about both of these business loan providers by reading their in-depth reviews here.